Adding detail to the information on the spider in Kirstenbosch (see Skeleton Gorge) Norman Larsen sent me one of his pictures of the Nephile fenestrata, apparently only seen on this side of the mountain since 2002. Pic taken on Sunday with male on the abdomen just after mating. 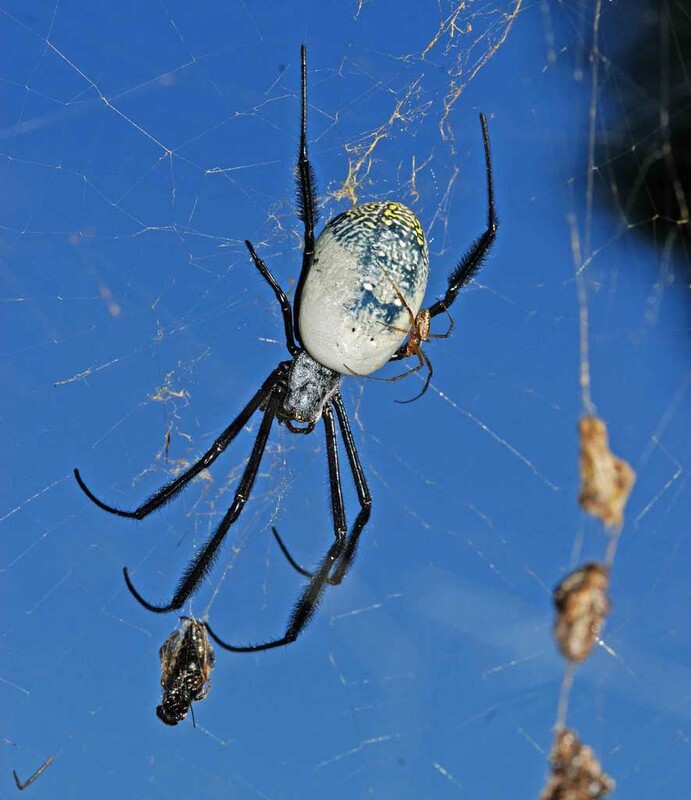 The female on the leaf with egg sac has not got the swollen abdomen as she has just laid her eggs. The smaller spider is Cyrtophora citricola, family Araneidae, with all attending webs of juvenile spiders. could someone come and identify it? Hi Justin, have a look at the following website – http://www.biodiversityexplorer.org/arachnids/spiders/ask.htm – the spider expert is Norman Larsen. If you can send him a photo I am sure he will help you identify it.